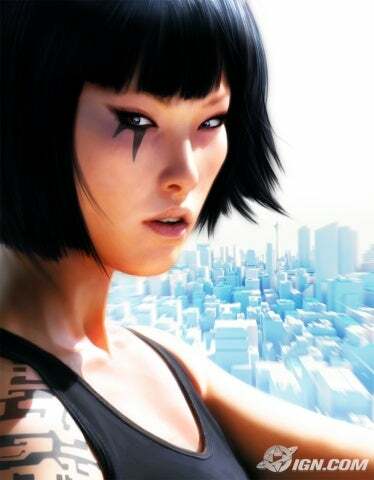 I’ve been playing Mirror’s Edge lately. It always looked intriguing, and there’s something hypnotic about the picture of Faith on the cover— perhaps that fact that her mouth is too small— but I was scared away by Yahtzee’s review. Fortunately, Yahtzee was wrong; it’s really a lot of fun, though of that peculiar sort of fun that involves enormous amounts of swearing and pointing at the screen with a gun hand making shooting noises. A lot of the moves require very precise timing, and there aren’t enough savepoints, so if there’s a particular spot you’ve missed you have to keep trying not only that bit but the half-minute leading up to it, giving you a chance to re-blow previous moves you already accomplished. You can’t save the game at all on your own. On the plus side, this means you tend to actually learn the moves rather than bungle through, and it’s a real thrill to get a sequence right and fly across the rooftops. For me, whose last experience with what the kids are calling “platformers” was Lode Runner, it’s a neat, novel form of gameplay. A million games let you be a swordsman or shooter; it’s more interesting to be a parkour specialist. The visual design is spectacular; rather than the usual dystopian muddle, the designers have gone for a bright white palette with accents in bright colors. It’s really a beautiful game. Key objects are highlighted in bright red (e.g. the bar below), though if you’re an insane person you can turn this off and figure your own way around. I’m only partway through so I can’t say if the plot elements turn out to be interesting or not. I’d venture to say it’s going to require a certain suspension of belief: every element so far turns out to require a long trek over the rooftops. Doesn’t Faith ever just take a taxi? I’m guessing that some of the criticisms derive from the original price and short gameplay. It’s just $20 on Steam now, though, which seems like a bargain. One complaint: there’s no manual, so when I’d forgotten how to do a particular maneuver I had to replay the tutorial. It was left-shift, by the way. It’d also be nice to have integrated third person… I see that there’s a way to hack this in, but the results look clunky– unlike (say) Fallout 3, the designers obviously spent most of their time on first-person mode.